Your air conditioning/heating unit is your home’s largest user of electricity. Fortunately, it’s possible to save up to 30% or even more on your heating and cooling bills. Set the thermostat on “auto” at 80 degrees or higher during the summer and at 65 degrees or lower during the winter. For increased energy savings, set the thermostat at 82 / 84 degrees in the summer while away from home. Your savings will depend on how much you lower and raise the thermostat setting and what the climate is like. Install a programmable Wi-Fi compatible thermostat, which will not forget to adjust temperatures for energy efficiency when needed. This is easy to install and allows you to program your unit to turn on/off at certain times, allowing you to save precious conditioned air and money when not needed. A simple and very inexpensive maintenance job in air conditioning and heating systems is to replace or clean dirty air filters once a month. Filters that are dirty make units operate longer, increasing costs. Clean filters also keep dirt and dust out of fans and motors, prolonging their useful life. If your filters are extremely dirty, examine the coils of the unit to see if they also need cleaning. Shade and trim shrubs away from outdoor compressor units. Anything restricting free airflow around or over the top of the unit will cause it to operate longer. Remember to inspect ductwork and repair leaks large and small. Have system serviced by a qualified air conditioning contractor before the cooling and heating seasons. This should include, but is not limited to, the cleaning of evaporator and condenser coils, making all necessary adjustment, checking thermostat calibration, testing the refrigerant levels and sealing any leaks, and inspecting/sealing all duct work. Add for upgrade building insulation. Check weather-stripping and caulking around windows and doors. Homes that are reasonably airtight cost less to cool and heat. Plastic shields are available for jalousies and poorly fitting windows and doors. If you don’t presently have a high efficiency heat pump, find out more about it. This electrical device “pumps” or moves heat from one place to another more efficiently compared to the heat-strip type alone. 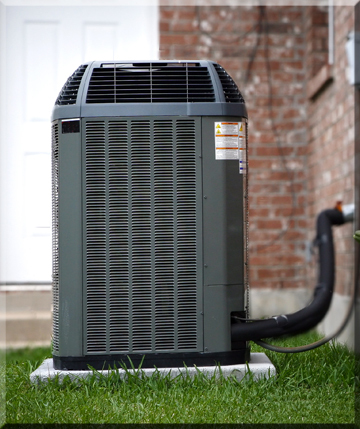 It may be used to both heat and cool your home, making this an economical replacement to inefficient non-heat–pump models. Heat-strip models typically cost up to 4X more to operate in the winter months. Protect windows from the heat gain in summer and heat loss. In the winter by installing awnings, draperies, window film or shades and planting deciduous trees. The Department of Energy recommends a solar heat gain coefficient (SHGC) in Florida climate with a SHGC <0.25. What Should I Look for when Purchasing a New High Efficiency Air-conditioning System? The Federal government has passed laws which require manufacturers of energy intensive equipment and appliances to meet minimum efficiency levels, to use standardized test methods to determine these levels, and to label each product with its efficiency rating. The Energy Efficient Rating (EER) is for comparing window air conditioners, a Seasonal Energy Efficient Rating (SEER) is calculated for central air conditioners and heat pumps (cooling mode), and a Heat Seasonal Performance Factor (HSPF) rating is for heat pumps (heat mode). These ratings, which compare the energy efficiency of similar units, usually are found on a tag or label on the equipment. Does Your Air Return System Leak? Partition wall is open to attic. Return plenum is not lined with duct board or seams of duct board are not sealed. Recommended sealing partition wall top with a fire rated material such as duct board or sheet rock and caulk. Also line return plenum with duct board and seal corners with plastic gauze and mastic. Opening exists where supply plenum enters attic. Unconditioned air drawn into heating/cooling system through panel seams on air handler. Recommended taping accessible seams with foil duct tape and sealing opening in ceiling with a fire rated foam sealant, duct board or sheet rock. Apply caulking if using duct board or sheet rock. Top of partition wall seams around air handler are open. Return plenum is not lined with duct or seams of duct board not sealed. Recommend caulking partition wall seams from the attic and lining return plenum or sealing corners of duct board with plastic gauze and mastic. How Thermostat Settings Affect Operation Costs? Raising a cooling thermostat and lowering a heating thermostat are the easiest and move effective way to lower most electric bills. Air-conditioning in most home and public buildings accounts for up to 60% of energy usage on the monthly utility bill. Recommended settings for normal operation are 65° for heating and 80° for cooling, keeping the fan set at “Auto”. If you are too warm at 80°, an ordinary circulating fan may be used simultaneously for additional relief. Warmer clothing may be necessary for some at 65°. Nighttime temperature set back may save between 10 to 20 percent of the annual heating bill if the temperature is reduced at least 10 degrees for 8 to 10 hours. This savings can be substantially reduced if you use an electric heat pump. Set the temperature back a few degrees for energy savings. If concerned over increased humidity, pets or plants, set thermostat at 82°/ 84° in summer and 55° in winter. Pour 1 cup of vinegar down the condensation line every month to keep it flowing freely. Manufacturer’s warranties require preventative annual HVAC maintenance service in most cases. If you notice your HVAC system is taking longer to cool or heat, this may indicate a mechanical problem. Please don’t delay, waiting to report this issue to a qualified air-conditioning contractor could cause increased damage to your system or increased energy usage. KUA asks you that when having your existing system serviced, please ask your technician to clean and recycle the refrigerant instead of simply releasing it into the atmosphere. Thankfully, refrigerant manufactures are phasing out these harmful products. When you buy new equipment, please look for makes and models that contain refrigerants that don’t damage the ozone layer.